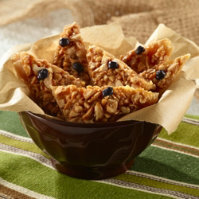 Scare off hunger with these delectable appetizers. 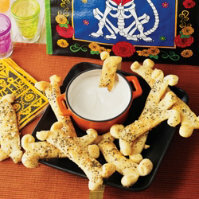 From salty to sweet, try these Halloween twists on your party favorites. 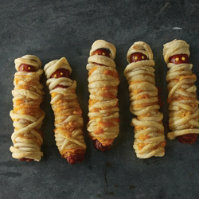 Use puff pastry and cheddar cheese to mummify these grab-n-go snacks! Everyone can add their own faces with ketchup or mustard. Everyone will devour this quick and easy guacamole dip. 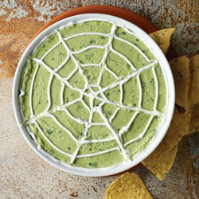 For a spooky twist, add a spider web with sour cream. 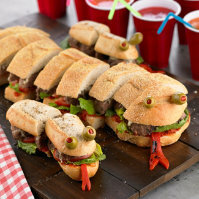 Make your own creepy crawly meatball subs! Sure to be an appetizing addition to your party spread. 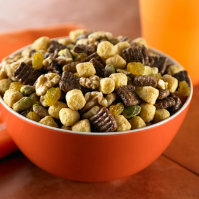 Snack on this mix of walnuts, pistachios, chocolate squares cereal, peanut butter crunch and H-E-B Golden Raisins. The sharp point on these sugar cookies reminds us of a wicked witch's nose! Don’t be afraid, these cookies are loaded with tasty dry roasted peanuts and a Mexican Caejeta. Cheese-lovers can't get enough of our Boo Fondue. The warm bones taste great with this three-cheese blend that combines cream cheese, parmesan and Gruyere. It might be a good idea to have a spare batch on hand. Don't go batty trying to come up with complex appetizers. 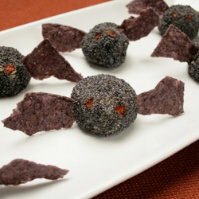 These cheese balls add a touch of Halloween to any spread. Get ghoulish with this twist on the classic rice crispy treat. 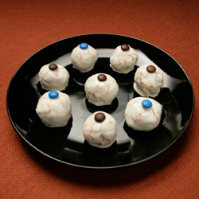 These deliciously frightening peanut butter balls are a guaranteed hit with zombies of all ages. 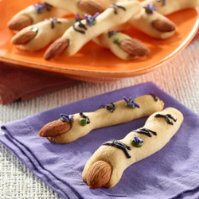 Finger food at its spookiest. Add spider rings for extra effect. Guests may also enjoy dipping their finger cookies in melted chocolate for an extra sweet treat.